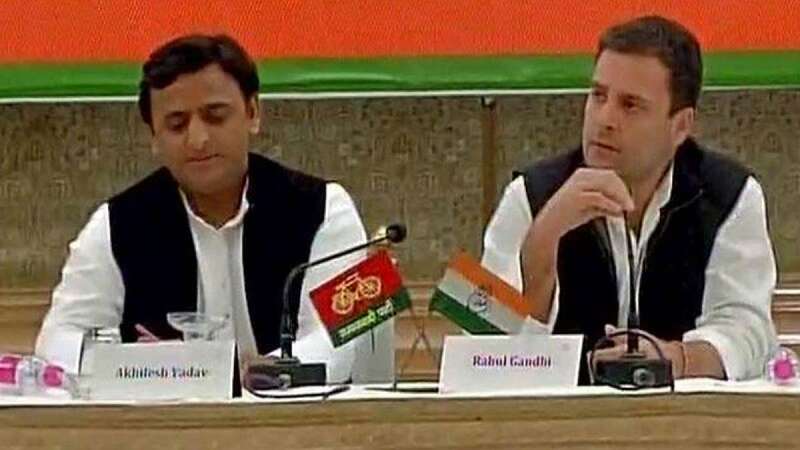 Lucknow : Uttar Pradesh Chief Minister Akhilesh Yadav and Congress Vice President Rahul Gandhi on Sunday held their first joint show, the latter likening their alliance to "Ganga-Yamuna milan". "Ek tarah se yahan Ganga-Yamuna ka milan ho raha hai, progress ki Saraswati isme se niklegi. (This alliance is the coming together of Ganga-Yamuna. The Saraswati of progress will emerge from this)," he said. "This is an alliance of three Ps -- Progress, Prosperity and Peace -- to fight the politics of anger, creating divide and making false promises," he said. Gandhi said the alliance would "fight fascist forces" such as the Bharatiya Janata Party and its ideological parent, Rashtriya Swayamsevak Sangh. Adding one more "P" to the Ps mentioned by Gandhi, Akhilesh Yadav said: "Let me add the fourth P. This will be People's alliance." Both leaders said their personal and political relations had got better after the alliance was forged to fight the Uttar Pradesh assembly election starting on February 11. "The Congress-Samajwadi Party alliance will make Uttar Pradesh stronger," Gandhi said.